The geography of Sussex has dictated where its industries have been located. These range from pre-historic flint mines and the armament trades of the 16th century with their furnaces and forges to the Victorian industries of our county’s urban centres. These have left their impact on the present landscape, as the tranquil hammer-ponds of today, remembered in such Wealden place-names as Furnace Farm and Forge Lane. The industries of the Low Weald, bricks and potteries, glass and tanning, have a lower profile in historical research yet employed large numbers of workers in the past, and brick making is still an economic factor in the county. Lewes itself was an industrial town well within living memory, while the spoil heaps of our Victorian lime kilns have become the jewel in the crown of the EU-protected Lewes Downs Special Area of Conservation. 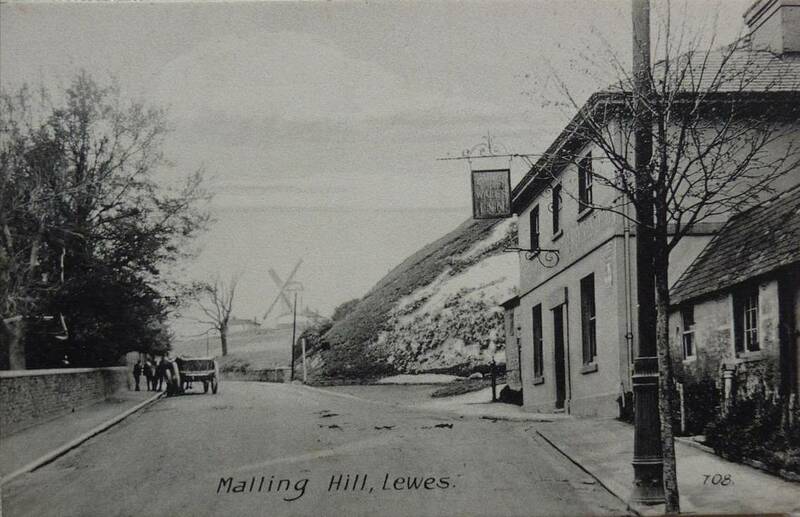 The Prince of Wales, Malling Hill, with Malling Mill in the background. 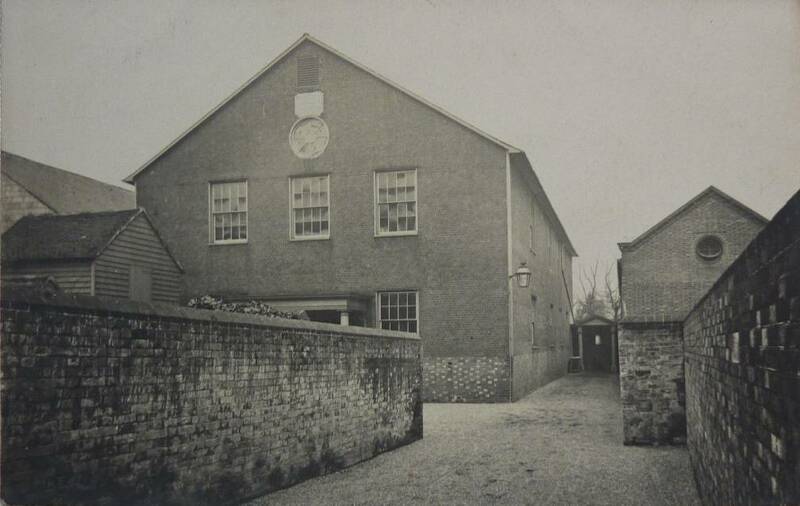 Jireh Chapel, seen from Malling Street. Both these postcards were from Tony Durrant’s Lewes collection. Only named establishments are listed below – there were additionally nearly 40 beer retailers, in all parts of the town, and a wine merchant or two. A high proportion of the named establishments are still with us today, nearly 150 years later. Only four of the named establishments qualified to be described as hotels – the Bear, the Crown, the Star and the White Hart. Bear hotel & commercial house, High street, Cliffe: Sydney Hamilton Adey. “Richard Savage was indicted [at the Sussex assizes] for stealing out of the Lewes waggon twenty-two yards three-quarters of scarlet cloth, twenty-six yards of blue cloth, the property of Thomas Friend, of Lewes, and a box, in which were contained two silk gowns and two guineas, the property of a person unknown, on April 5th, 1748. Mr. Friend deposed that he knew his servant put up the cloth, and ordered it to be carried to the waggon. William Brown, servant to Mr. Friend, deposed that he delivered the cloth to the carrier’s man. Matthew Comber, the carrier’s man, said he received the cloth from the last witness. That on the 5th of April last he was set to watch the waggon all night at Chailey; that two men came up to him about ten o’clock at night, enquiring what waggon it was; on his telling them, they took him away about two hundred yards from the waggon, where one of them kept him prisoner with a pistol at his breast; that then came up seven more men, who got off their horses, and left them at some distance from the waggon, with one man to take care of them. That the rest of the men went up to the waggon, and cut the cords, threw off some wool- packs, and then threw some boxes and other goods out of the waggon; that they broke open the boxes, took out the goods, loaded their horses, and went away. Thomas Winter, otherwise the Coachman, an accomplice, deposed that on the 5th of April, he and Shoemaker Tom, with the prisoner at the bar and several others, met at Deval’s house at Bird’s Hole, and agreed to go out and rob a waggon that was loaded with wrecked goods; that about ten o’clock at night they came all together upon Chailey Common, where they took the carrier’s man prisoner, and one of them kept him so, while the rest went and rifled the waggon. That they broke open several boxes and parcels, and took away a large parcel of scarlet cloth, and another large parcel of blue cloth, and a box with two silk gowns and two guineas in it, with other goods. That after they had loaded their horses they rode away to Bird’s Hole, near Devil’s Ditch, where they shared the goods; that the prisoner at the bar was with them in the robbery, and had a share of the goods. Thomas Dixon, otherwise Shoemaker Tom, another accomplice, deposed that he and Winter, and several others, met together at Deval’s house, at Bird’s Hole, and agreed to go and rob the waggon, as mentioned by the last evidence; that there they laid hold of the carrier’s man, took him some distance from the waggon, and set one of their number as a guard over him; that they then plundered the waggon, and took the cloth and other things mentioned in the indictment; that having loaded their horses, they made the best of their way to Bird’s Hole, and in a ditch near that place they divided the spoil. Being asked by the court if the prisoner at the bar was with them at the time of their committing the robbery, said he believed he was, but was not sure; but that he was very sure that he was present at the time of sharing the goods, and that he had his share in the dividend; and that this witness sold his share to the last evidence, Thomas Winter. The prisoner in his defence denied being any ways concerned in the robbery; but had no witnesses to call to contradict the facts as sworn by the witnesses for the prosecution. The jury brought him in Guilty of single felony. Transportation. It is common in the trials of the day to have one man convicted, perhaps of a capital offence, on the evidence of others, equally guilty, who had turned King’s Evidence, and thereby got off scot free. If you annoyed smugglers such as the Coachman and Shoemaker Tom in any way, might they turn on you, as they turned on Richard Savage above, and allege that you were responsible for their crimes? The defendant could not, at this time, give evidence himself. One can understand why any local people not actually involved in the smuggling gangs might nevertheless decide to keep very quiet about what they knew. An editorial in the 3 March 1893 Sussex Express (provided by Hilary Smith) saw the potential offered by the newly-popular bicycles to improve the defence of the realm. Library Corner was by the Fitzroy Library, at the bottom of School Hill. 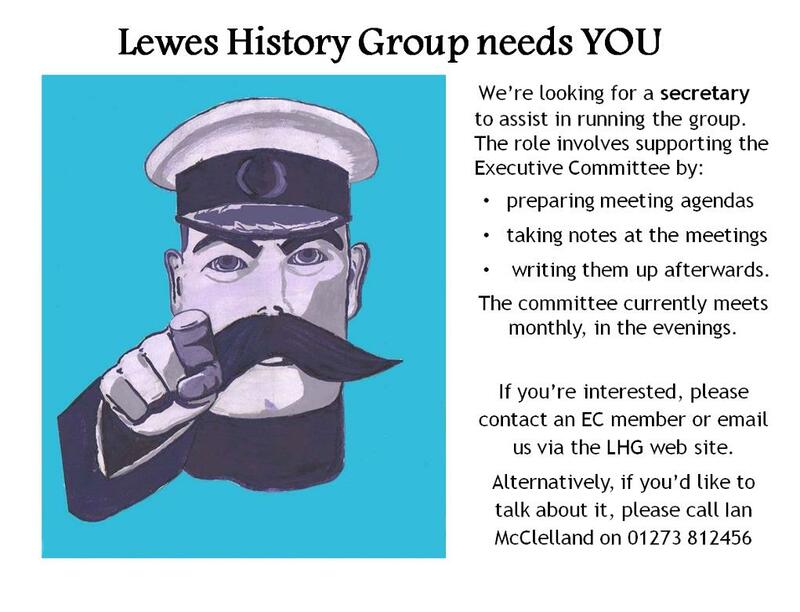 This entry was posted in Economic History, Legal History, Lewes, Local History, Social History, Transport History. Bookmark the permalink.